I recently acquired three new fantastic food preserving tools. 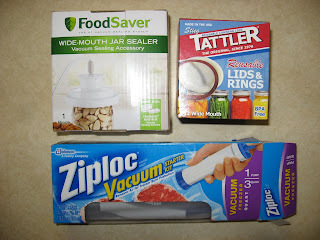 FoodSaver Wide-Mouth Jar SealerZiploc Vacuum Starter KitTattler Reusable Canning Lids & RubberIf one vacuum packs food (removes the oxygen which allows food to spoil) with a vacuum pump, food will last much longer in the freezer, fridge, or dried. I am a big advocate of collecting rain water for your garden, lawn, "distilled" water, household use etc. Start with a simple rain barrel and move up to more than one or bigger containers. 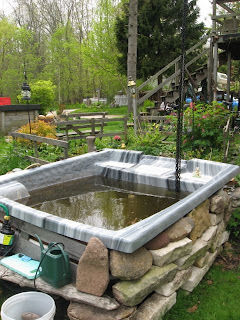 I have five 55gallon barrels, a swimming pool that holds 3000 gallons, two square containers that hold 250 gallons each, and an old hot tub (used as my fish pond) 300 gallons. These are great for emergency supplies but my main reason is to have free water for my garden. I know some people who pay $100 a month for water. Yikes! Around here you can get used barrels for $5 to $10. If you want them to blend in you can get spray paint specifically for plastic. Have a screen to keep out mosquitoes. 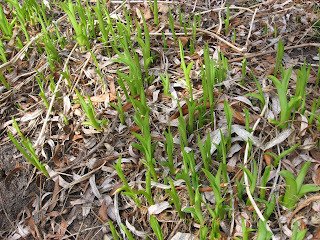 I keep gold fish in them instead as they are fun to look at and not only eat all the mosquitoes larva but fertilize the water to make my plants grow better. Another interesting article on biking. Over the years I have made many bike carts. While I lived in Tokyo, Japan, a country that uses bikes a lot for short distances, as an experiment I moved from one apartment to another using my bike cart. Yes, even there I got a lot of strange looks. "Research indicates that at least one quarter of all cargo traffic in European cities could be handled by cycles. And, by using special distribution hubs, larger vehicles and electric assist, this proportion could be even larger. A cargo cycle is at least as fast as a delivery van in the city - and much cheaper to use, giving a strong economic incentive to make the switch. Cargo cycles also bring important economic advantages to tradesmen, artisans and service providers." Hop over to Low-tech Magazine blog for some cool, different pedal powered ideas.